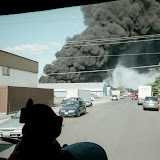 NARRATIVE: On October 1st, 2008 at 10:30 P.M. the Spokane Fire Department responded 4 engine companies, a pumper ladder company, 1 ladder company, 1 rescue unit and 2 battalion chiefs to a house fire located at 4621 N. Post. Upon arrival, fire crews found a wood frame structure that had fire coming out the front windows. Pumper Ladder 13's crew, the first to arrive, immediately attacked the fire while also asking for backup and a crew to ventilate the roof. It was soon determined that the adult occupant, who had been sleeping, had exited safely from the home. As the firefighters worked their way through the home to attack the fire, they soon found that the fire was mainly involving the front living room and kitchen areas. The fire was also rapidly extending vertically towards the attic. Through their fast and aggressive actions, the firefighters were able to knock down the fire and confine it to the front portion of the home and at the same time, keep it out of the attic area. The majority of the home was saved, however smoke damage was extensive throughout the building. A total of 24 firefighters responded to this call and it took them 15 minutes to effectively contain the fire. Fire crews will remain at this incident through the night conducting final extinguishment and making sure all of the "hotspots" are completely out. The Spokane Fire Department Special Investigation Unit was called in to investigate the fire cause. At this time, the incident remains under investigation. There were no injuries to firefighters or civilians. The home suffered extensive smoke damage and also sustained heavy fire damage to the living room and kitchen areas. PROBABLE CAUSE: Suspicious. Under investigation by the Spokane Fire Department Special Investigation Unit. DAMAGE EXTENT: Heavy fire damage to the living room and kitchen. Smoke damage throughout the structure. NARRATIVE: On September 28th, 2008 at 12:54 A.M. the Spokane Fire Department responded to a report of a structure fire at 558 E. Longfellow. Fire crews found a one story single family dwelling that was well involved in fire upon arrival. A quick attack using hose lines coupled with a rapid search of the interior of the home was conducted. Nobody was found in the home. The homeowner was located and contact was made to make sure everyone was accounted for. The fire extended vertically into the attic space and fire crews had to access this roof with ladders to begin the long and arduous process of locating and extinguishing what fire remained underneath it. This involved cutting the roof apart with chainsaws, circular saws, axes and pike poles. This task took approximately 3 hours to complete. Because the roof was weakened by the fire, care was taken to make sure the fire crews were in a safe position at all times. Avista assisted in controlling and securing the natural gas and electricity to the property. The house and contents sustained major fire, water and smoke damage. The cause of this fire is currently under investigation by the Spokane Fire Department Special Investigation Unit. A total of 20 firefighters responded on this alarm with 3 engine companies, 1 pumper ladder company, 1 ladder company, a rescue unit and 2 battalion chiefs. There were no injuries to civilians or firefighters. Fire crews remained at this location throughout the night working on final extinguishment and cleanup. DAMAGE EXTENT: Heavy fire, water and smoke damage to the structure and contents.